Last year, in August 2009, Seattle-based photographer Alex Nguyen and her husband took their two boys (then 1 years and 4 years old) to Astoria, Ore. Here’s what they enjoyed about this oceanside city founded back in 1810 – shortly after Lewis and Clark spent a winter at the nearby Fort Clatsop. All photos are provided by Alex — and were taken by her as well. Q. Was Astoria, Oregon very family-friendly? Overall the town of Astoria was very kid-friendly. It was walkable, there were some great hikes just a short drive away (we ended up driving back across the Washington for some hikes), and there was a cute children’s museum in town as well. Q: Did you find a family-friendly hotel in Astoria, Oregon? We stayed at Clementine’s B&B. They were very family friendly! Our downstairs room included a living and eating area plus a kitchen and bath area. Upstairs was the bedroom with two queen beds, and another bath. It was great putting the kids to sleep upstairs and still be able to go downstairs and have some grown up time. Q: Which Astoria museums did you visit with kids? We visited the Columbia River Maritime Museum, which was a big hit with my 4 year old, but really boring for my 1 year old. My older son liked it so much, he wanted to return. The boys also enjoyed being able to step out on the real boats outside and checking those boats out. The staging of a US Coast Guard rescue inside the museum was great discussion material for my oldest. 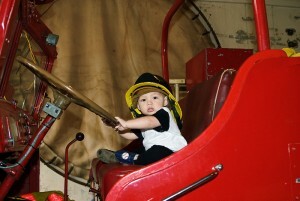 The Children’s Museum was upstairs, the Uppertown Firefighting Museum was downstairs. It was a big hit with both kids. I think the Children’s Museum stated it was moving to a different location, but I’m not sure where. (Lora’s Note: It moved, but retains many of the play centers). Downstairs there were two different fire trucks, plus all sorts of hoses, hats and gear for the kids to try on and pretend to be firefighters. There was also a huge chair for reading stories. Upstairs it was much more geared toward the younger set (I would say ages 1-3 would be ideal). My oldest enjoyed playing with the special doctor’s office exhibit and a really cool log cabin. Q: Did you go to any kid-friendly Astoria restaurants? We ate at the Wet Dog Cafe and Astoria Brewing Company (Facebook page), which served pub-style food (sandwiches, really good burgers, a few salads, fish and chips and some other really good seafood options). The kids’ menu had fish and chips, chicken fingers, mac ‘n’ cheese and the like. The fries for the kids were actually cut like thick coins, and had a happy face cut out in the middle (two eyes and a smile). You could hold it up to your face and see through the eye. 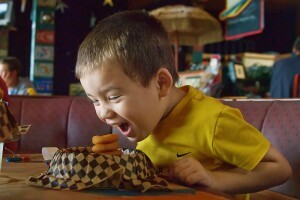 My son totally loved those fries. And the food is served in an actual (clean) dog bowl. We also ate at a Bosnian restaurant called Drina Daisy. Very friendly staff, good atmosphere. My kids are adventurous eaters, so I would not recommend it to people who maybe have picky eaters, but it was quite delicious. Most restaurants were closed on Monday, and we were there Monday through Wednesday. Q. What other kinds of things did you do with kids in Astoria, Oregon? We drove to and hiked in Cape Disappointment, a 10-minute drive across the border in Washington . The campground and park itself was beautiful, but the actual lighthouse WAS a big disappointment. I thought there would be an open area to visit. But the whole area is fenced off. The hike was pretty, but I wouldn’t have trekked it if I had known it was just for the view. When you arrive in the park, there’s a lighthouse called the North Head Lighthouse that you can drive right up to. They gave tours, even though it was a working lighthouse. If I had to do it again, I would have hiked to the Lewis and Clark Interpretive Center, where my husband went with my 4 year old. The center had some interesting facts, so my 4 year old liked it a lot. Plus there were bathrooms there. The trails were fairly easy, so even my older son was able to hike the whole way. I carried my toddler in a ring sling because he fell asleep, but the lighthouse was only about a half-mile, maybe ¾-mile hike from the parking lot. Along the hiking trail at Cape Disappointment State Park, the trail splits to the lighthouse and the Interpretive Center. 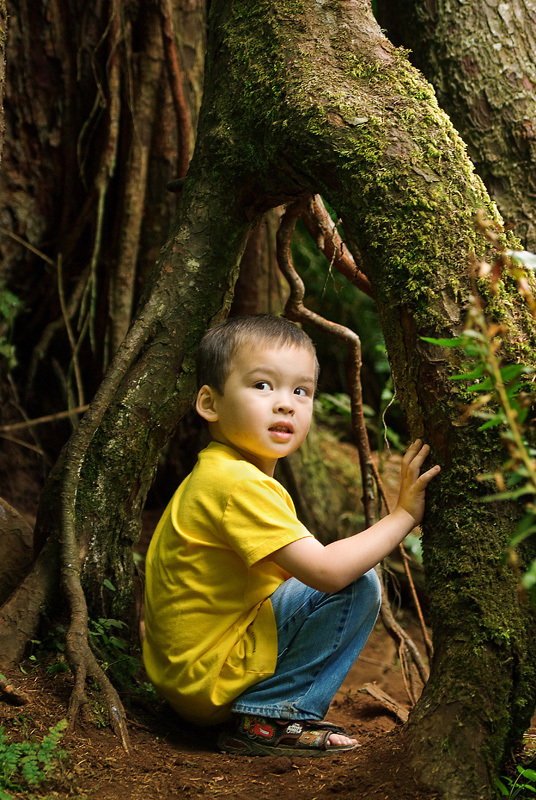 They had all these wonderful trees and my son played peek-a-boo in the trunks. Getting There: Astoria is two hours west of Portland, Ore. Also of note: The Astoria Aquatic Center‘s twisty slides, 88-degree pool and waterfalls galore. Astoria is also a short drive from kid-friendly fun in Long Beach, Washington.